Building a home is a very exciting time, but building a home adds an extra layer of anticipation to the process. If you are building a new property customized to your specific tastes, you know how the details of the design and construction process matter. Don’t forget about the wiring. 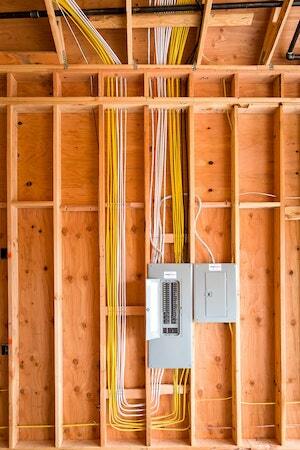 Wiring new construction homes is a crucial part of the process, and our team at Prairie Electric is experienced in a variety of electrical work for new construction homes. Building your dream home? The details are a priority and electrical work is a key component to making your home operate the way you want when you want it. To maximize efficiency and get your home wired to stay within building deadlines. Prairie Electric employs large, diverse crews that have the knowledge to get the job done right. We have products on hand to cover any on-site needs and our licensed and insured electricians are focused on making sure installation is done well so you and your family are safe for years to come. Our experience wiring new construction speaks for itself. With over 35 years in the industry, Prairie Electric is dedicated to listening to each customer’s specific needs. So, no matter what your new construction project looks like, you can count on our team to provide professional electrical installation service. Once everything is installed, we offer 24/7 emergency support for residential customers that may have an issue arise once you are settled in your new home. You can count on reliable service all year long. If you are planning on building a new home and are looking for a reliable team of licensed electricians to get the wiring installed in time for move in day, contact Prairie Electric! We are standing by ready to talk to you about your new construction project.